The new Ruger Redhawk .357 mag (l) and GP100 .44 special (r). Sturm Ruger & Company has just announced the release of two new calibers for their very popular GP100 and Redhawk model lines. 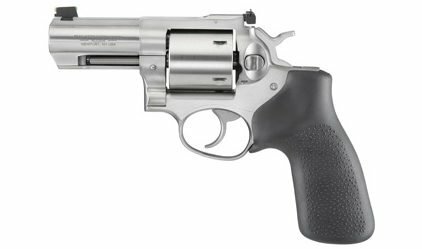 The Ruger GP100 will now be offered in .44 Special while the Redhawk will add a .357 Magnum to its line. Revolvers have been all but replaced by semi-auto pistols in modern American law enforcement. 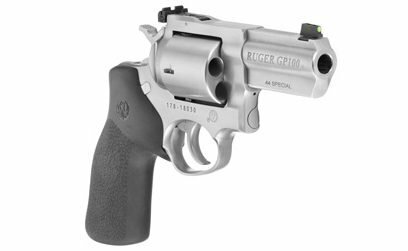 However, there are still law enforcement officers who carry the venerable wheel guns, and these two new Ruger options have features that could offer very viable selections for those who still prefer to carry a revolver. Ruger continues to deliver new and impressive firearms. 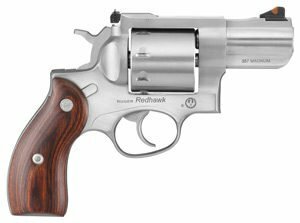 The new Redhawk in .357 Magnum (Model 5033) comes with all of the classic features of the Redhawk line of revolvers. This includes a triple locking cylinder, single spring for smooth trigger pull, stainless steel construction, and a patented transfer bar for additional safety from accidental discharge. The Ruger Redhawk line has already proven itself with models chambered in .44 and .45, and even .41 Rem mag. Like other Ruger revolvers, the manufacturing process is top of the line, and the finish is near custom shop quality. With true hard wood grips the Ruger Redhawk revolvers not only take on a classic appearance, but a value on their own. The 8-shot Redhawk .357 mag offers a lot of firepower. The Redhawk produces a very manageable recoil, even with magnum loads, through the design feature of extra metal in the top strap, sidewalls and barrel mounting areas. In addition, the specially curved hardwood grips are designed for superior grip allowing recoil to be absorbed in the meaty portion of the shooter’s palm. The un-fluted Redhawk cylinder incorporates a recessed ejector, allowing shooters to quickly load the revolver with the use of full moon clips. The new .357 magnum Ruger Redhawk will ship with (3) full moon clips. Patented transfer bar mechanism for unparalleled security against accidental discharge. The new Redhawk .357 magnum is a nice addition. The new .44 Special GP100 combines power and beauty. The new GP100® .44 Special has a 5-round cylinder. The big-bore GP100 (Model 1761) comes with a 3-inch, full-shrouded barrel for the perfect balance between size and weight. 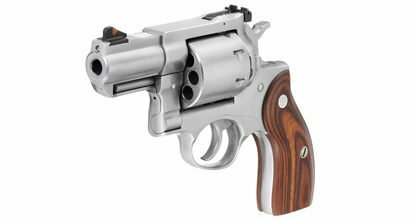 The all-stainless steel .44 Special GP100 absorbs recoil very well, and comes back on target quickly whether shooting cowboy loads or higher velocity defensive loads. The smooth Hogue® Monogrip®without finger grooves is attached to the proprietary Ruger® grip frame and is designed to fit nearly all hand sizes and shapes. The grip frame allows for a quick change to custom grip configurations if the shooter desires. Ruger offers a large selection of their own customized grips. The new GP100 .44 is dual chambered for Special and Magnum rounds. The new GP100, unlike the Redhawk, uses a fiber optic post front post sight. The rear sight is adjustable like the Redhawk. Recoil-reducing, cushioned black rubber Hogue® Monogrip®. The new GP100 .44 Special with Hogue grips. I have always appreciated Ruger and the unique firearms they have been willing and so capable of producing. From the early cowboy action revolvers to the modern and new Redhawk .357 magnum and GP100 .44 Special, Ruger continues to make real winners. 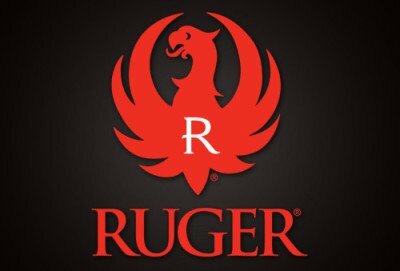 Over the last 5 years or so Ruger has begun a major move to distance themselves from the competition. Producing several truly new firearms each year, enhancing existing models, and producing literally millions of new firearms each year, Ruger is making a strong statement to become America’s gun maker.